machinist at Spectra Physics) and Clara (a payroll clerk at Varian). occupied on January 28, 1978. 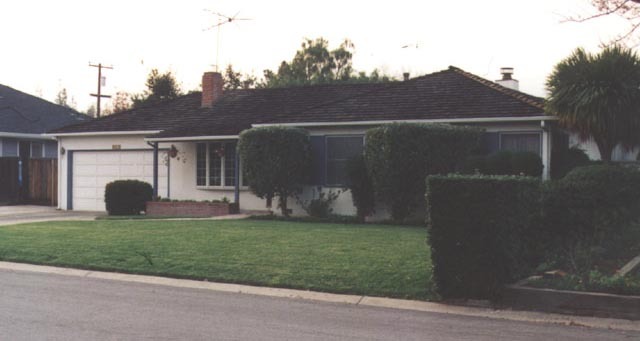 The garage of Steve Jobs parents on Crist Drive in Los Altos. fellow by the name of Ronald Gerald Wayne, 41.
partner in Apple by offering him 10 percent interest in the company. birthday). Terrell was intrigued and asked Jobs to keep in touch. catch to the $25,000 order: Terrell wanted fully assembled computers. co-workers at Hewlett-Packard), then convinced suppliers to extend 30 days? credit on $15,000 worth of parts. and I had lost the energy you need to ride whirlwinds.?
? [The Byte Shop order] was the biggest single episode in the company?s history. first retail computer store chain in the world and Apple?s first big customer. Markkula boldly set a goal for sales to grow to $500 million in ten years. for $800 less than a year ago, was thrilled to receive this unexpected windfall. Paul Terrell went on to found Romox, Software Emporium, and Sorcerer Computer. ?Mike? Markkula Jr. stepped in when Ron Wayne bailed out of Apple. assume that Wayne?s 10 percent would have equalled more than 1.6 million shares. splitting the profits with Woz. In keeping with the spirit of ?phone phreaking,? married soon after their playful start. couldn?t dream of a more appropriate logo: lust, knowledge, hope, and anarchy.? first duties after co-founding Apple was to design a logo for the infant company. this day, a low employee number is a badge of honor in the corridors of Apple. Festivals, but he had fun and still considers them successful. Steve Wozniak eventually returned to college to complete his degree. dog at the time was named Rocky. Q.
in San Francisco?s Moscone Center during a celebration called ?Apple II Forever.? through an expansion card for some early Mac LC and Performa models. California, on July 18,1983, as part of the ?Kids Can?t Wait? program.